A beautifully renovated and spacious 1 bedroom, 1 bathroom loft-style apartment with approx. 12' ceilings offers peaceful living in the heart of Soho. It is approx. 937 SF, the oversized windows have eastern exposures, there are wide-plank floors, and a generously-sized open kitchen with Sub-Zero stainless steel refrigerator and wine cooler, Bertazzoni 6-burner gas range and oven, plus Lefroy Brooks fixtures. The marble bathroom floors comes with Radiant-heat. The apartment also has zoned climate control, has been smart home wired, including iPad and voice controlled television, and shade control. There is also a Miele front-loading washer and dryer. 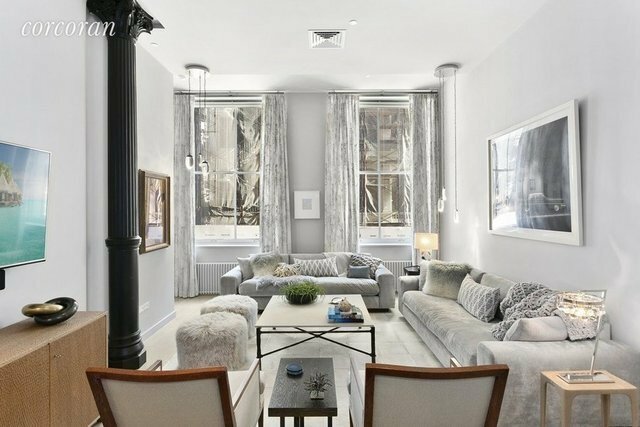 Note the chandelier lighting is excluded.63 Greene Street is located in Soho's Cast Iron Historic District. Originally built in 1877 and converted to a condominium in 2016, this 6 story boutique building offers, part time doorman, renovated lobby with mosaic marble flooring, package room; bicycle storage; landscaped common rooftop with triple: south, east, and west exposures.